Realizing efficiency and cost-savings across data center operations has become top-of-mind for data centers operators and managers. The Uptime Institute estimates that today’s power-hungry data center environments collectively consume approximately three percent of all global electricity production. As the price of energy continue to rise, many operators are searching for new methods, technologies and strategies to save on electricity costs. Electronic Environments Corporation (EEC) is well-known for its unique, holistic approach to servicing the complete data center lifecycle from planning, to design and maintenance, utilizing a combination of proven, proprietary methods with the latest innovations and technologies for nearly three decades. One of the latest technologies we’ve added is a portable device called “AUDIT-BUDDY™” created by Purkay Labs. AUDIT-BUDDY uses the latest diagnostics technology to record data center temperature and humidity, providing a simple and highly effective way to enhance data center cooling efficiency and trim excessive energy costs. Utilizing this device during assessment methods, EEC is able to effortlessly diagnose problems and determine the most advantageous methods to improve airflow management in any data center. Recently, EEC utilized AUDIT-BUDDY within the data center of a large healthcare facility. Taking baseline temperature and humidity readings of well over 100 racks in less than a couple of hours, AUDIT-BUDDY allowed EEC to reduce the amount of time required to get accurate readings compared to alternative methods and tools used in the past. The output reading enabled EEC to clearly detect potential problem areas and make simple adjustments, such as changes to perforated tiles and the addition of containment curtains, to reduce temperatures in a particularly dense aisle in the data center. One area of concern was captured with output of AUDIT-BUDDY’s readings (see Figure 1). For easy-to-use and comprehensive diagnostic readings, AUDIT-BUDDY has three convenient modes: LongScan, QuickScan, and Delta-T.
LongScan is most useful in determining change in temperature and humidity over time. By setting the AUDIT-BUDDY in front of a server for a fixed period of time, users can record long-term, time-stamped data that provides greater detail into potential problematic areas such as hotspots and overcooled locations. QuickScan provides users with the ability to evaluate whole aisles by taking 20-second scans in front of each server rack. Through this method, AUDIT-BUDDY is able to characterize an aisle using real-time information. 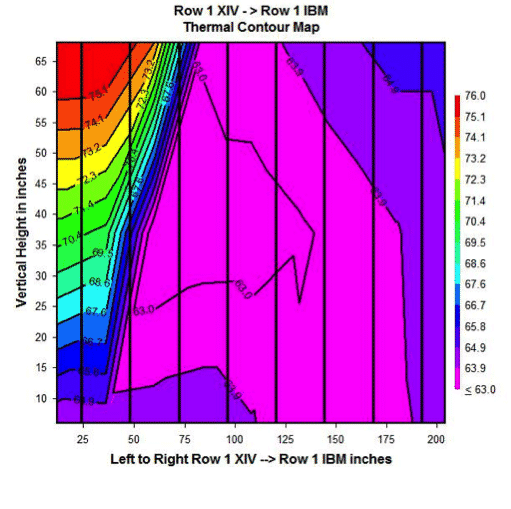 This tool can create a thermal survey of all aisles in a data hall, validate CFD analysis, and visualize host spots and cold air loss. Finally, the Delta-T mode uses two AUDIT-BUDDY systems, one in front of the server and one in the back of the server to determine the amount of cold air that is diverted from the server. This mode provides the necessary data to improve cooling effectiveness and lower energy costs. EEC is dedicated to providing clients with the most advanced support throughout all stages of a data center’s lifecycle. Treating and servicing facilities as their own, EEC offers a wide array of services to increase overall productivity of mission-critical data centers. EEC is constantly seeking new and innovative methods to proactively diagnose and rehabilitate potential issues in order to ensure highly efficient functionality throughout. AUDIT-BUDDY has provided a fast and easy method to obtain fundamental data points for immediate detection of potential problem areas as well as detailed ongoing analysis, allowing EEC to service its clients more effectively than ever. To learn more about EEC and its mission-critical services, visit www.eecnet.com or email info@eecnet.com. PreviousARIN + NANOG On The Road comes to Madison, WI!